Hi all, I have a 2013 Ford Focus SE flex fuel with leather seats and sun roof. I'm wanting to trade it in because I've just spent so much time getting repairs done (mostly covered under warranty). It has fewer than 76,000 miles on it and I'm not feeling like it was a good investment at this point. Just interested in others' perspectives on whether or not to trade in, hold on to it, or try to pursue arbitration through the law suit. Thank you so much for sharing your experiences and advice! Everyone's situation is unique, so we can't tell you what to do. However, I will give you some points to consider to help you make a decision. Your car is of the age where it has already taken most of its depreciation. If you sell the car now, it will have cost you more in depreciation dollars per year than if you continue to own it. At 76K miles, there is a lot of life left in your car, even before maintenance costs begin to increase. These are arguments in favor of keeping the car. If the car has been particularly unreliable for you, it may not be worth the hassle of keeping it, particularly if you have had a lot of downtime for repairs, you might want to sell the vehicle to avoid the ownership hassles. However, if the transmission still has not been repaired, you will likely take a hit on resale value even though it is still covered under warranty because the next owner or delete will,have to deal with that issue. Conversely, if you sell now, you could offer the next owner some peace of mind knowing he/she still has some warranty coverage for the transmission. The best case for selling would be a transmission that is currently working properly and still has some warranty left. Personally, I would keep the car if the transmission has been the majority of your issues and it has been fixed and is currently working properly. If you've had a lot of issues besides the transmission, you might want to sell for a different car that could give you a better ownership experience. 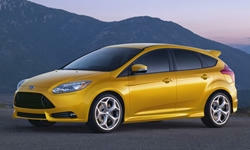 I had a 2013 Ford focus ST. It was only a summer vehicle and had low mileage. I traded it in the spring because ford could not solve the check engine light issue, which caused the vehicle to run in limp mode and meant I never got full boost. There are so many problems with the Focus. I would probably sell it while you have it running. Make it someone else's problem and buy a Civic or Corolla with a price similar to what you get for the Focus. Major problems for the Focus include the auto transmission, power steering failure, and radio malfunctioning.